Read "Architecture of a Cold August"
The thunder in your blood." — "Waiting Room in Missouri"
Whether Judith Root is sitting in a doctor's waiting room, barnstorming in a red and white plane, or simply observing two couples on a quilt in a park, her sharply rendered poems trace currents of time and tides through shifting seasonal rhythms as they shape our intentions, permeate our past, and illuminate the present moment. 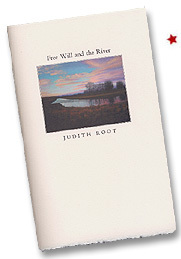 Judith Root's first full-length collection of poems, Weaving the Sheets, was published by Abattoir Editions (Univ. of Nebraska-Omaha) and reprinted by Carnegie Mellon Univ. Press. Her poems have appeared in Poetry, The Nation, American Poetry Review, Commonweal and others. She recently received a fellowship from the Idaho Commission on the Arts. She has taught writing at universities in Minnesota, Missouri, California, Texas, North Carolina and others and now lives in Portland, Oregon.